This year Dr. Steven Shoshany is proud to present his updated NYC Marathon Readiness Protocol. Building on his years of recovery and preparatory treatment of professional runners, the 2017 edition is even more personalized between individuals, and new for this year is the addition of Class 4 Hot Laser therapy. It is rarely too early or too late to get proper chiropractic care. You shouldn't necessarily wait until you’re in too much pain to train. It's once again time for one of the most prestigious land races in the world. The New York City marathon will be taking place on Sunday, November 5th. Dr Steven Shoshany finds himself very busy this time of year. 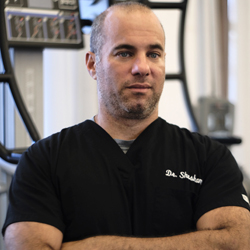 Not necessarily due to the newly injured amateur runners that he treats routinely at his SoHo practice, Dr. Shoshany will be helping many competitive runners prepare for the upcoming marathon. Dr. Shoshany happens to be one of the most prolific providers of non-surgical care to distance runners. He routinely treats professional and semi-professional runners throughout the year. This year Dr. Steven Shoshany is proud to present his updated NYC marathon readiness protocol. Building on his years of recovery and preparatory treatment of professional runners, the 2017 edition is even more personalized between individuals, but still shares the common core of chiropractic, physical therapy, and massage. New for this year is the addition of Class 4 Hot Laser therapy. Over the course of treating runners for over 15 years, Dr. Steven Shoshany has developed specific protocols for helping treat and even prevent running related injuries. Many of the NYC competitive distance runners, also happen to run double digit middle distance events, and multiple marathons throughout the year. Training and competing puts a lot of cumulative miles on the body along with wear and tear. The question as to why chiropractic would be to critical to running, and recovery from running related injuries, is not a new one. Because chiropractors are usually associated with back and neck pain treatment, a lot of people do not make the connection between the spine, running mechanics, and overall physical conditioning. Because chiropractors also help balance the skeletal structure and address the entire kinetic chain when looking for the source of pain, the treatments often go well beyond the spine. Chiropractors, when it comes to running, help balance the lumbo-pelvic-hip complex. The pelvis is often the center of dysfunction, when it comes to running. When you bounce, the pelvis and spine have to compensate and articulate for proper weight distribution, and this also runs down the kinetic chain, to the ankles knees and feet. Dr. Shoshany feels that this has made him essential to a lot of NYC marathon runners’ when it comes to preparation, and recovery.